Mariachi Los Gallos packs a powerful punch with near perfect execution of the mariachi art. 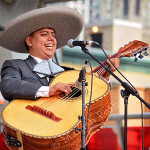 Led by Roberto Mestizo, Mariachi Los Gallos has quickly earned its reputation as one of the best mariachi bands in the country. Performing at prestigious events throughout Canada, members of Mariachi Los Gallos have proven themselves to be musical ambassadors representing the beauty of the Hispanic culture and creating a bridge of cultural understanding between Mexico and Canada. 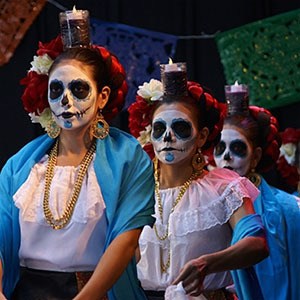 Be enchanted as Ballet Folklorico Puro Mexico performs a vibrant repertoire celebrating the life of loved ones that have passed for our Day of the Dead festival. With special guest, singer, Cecilia Guerrero. Ballet Folklorico Puro Mexico (BFPM), under the direction of María José Miranda and artistic direction of Jezreel Vasquez, is a non-profit organization that has been active within Toronto´s multicultural community for over 10 years. BFPM has participated in various events within Toronto and its surroundings such as The International Stage at the Canadian National Exhibition, Mexican Fiesta in London, Ontario, MexFest at Yonge-Dundas Square and the Scotiabank International CHIN picnic, where it won first prize within the adult folkloric dance competition in 2010. Calavera is a representation of a human skull. These edible skulls, made from sugar, are used in the Mexican celebration of the Day of the Dead as décor and in ofrendas to the beloved departed. Families are invited to decorate their pre-made sugar skulls with royal icing and decorative materials and can then add their sugar skulls to the community ofrenda. A minimum of 200 skulls will be available both days for children to decorate. The Wunderkabinett Collective was recently formed by Steve Lorreta and artist Elizabeth Jackson Hall. 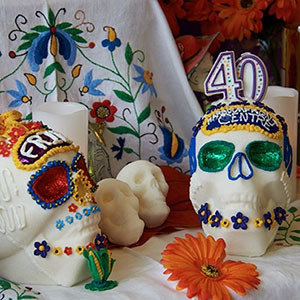 Steve Loretta, local sugar skull artist and ofrenda builder, began children’s activities using Day of the Dead imagery at Brick works in Toronto in 2010. He developed a passion for making ofrendas and sugar skulls. He currently makes sugar skull kits and last year premiered an ofrenda at Harbourfront Centre in honour of Frida Kalho. 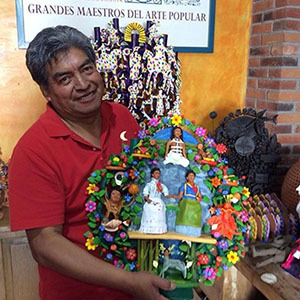 Come experience a master of Mexican folk art, as Tiburcio Soteno Fernández, from the Soteno family of ceramic artisans, works with clay and teaches the methods and tricks of ceramic artisanship. The Soteno family of Metepec, is one of the main families of ceramic artisans specializing in sculptures called Trees of Life (Árbol de la vida). The Tree of Life is a intricate, colorful sculpture which was developed from the creation of candlesticks. Soteno workshops are mostly intergenerational, with various members of a family working together. These workshops produce Nativity scenes and other Christmas items. Pieces for the sets can range from fifty to seven thousand pesos with pieces up to 1.2 meters tall. Many have skeletons and skulls associated with Day of the Dead. It is a festival marked throughout Latin America, but most strongly associated with Mexico, where a tradition of reverence for the departed was being practiced by indigenous Aztec people since at least 3,000 years ago. Although the celebrations have since been merged with Catholic theology, they still maintain many of the aesthetic properties and the basic principles of many indigenous rites and rituals, such as the use of skulls (calaveras) and copal incense. Through centuries the ancient rituals of Mesoamerican civilizations have merged with new beliefs, rituals and practices, and have transformed this festival into a unique twenty first century celebration. There has been migration of traditions and rituals. Even the old Aztec Goddess Mictecacihuatl (the Lady of the Dead), has found a new identity as the modern “Catrina” the lanky, skeletal female figure bedecked in sumptuous clothing and giant ornate hats. Today the festival brings together ancient traditions and contemporary memories of the Mexican people. It is the transformation from one elemental state of being to another: alchemy. It is a transformation from life to death and into life again. Alchemy achieved through offerings, remembering, and celebration of the departed. This celebration is not unique to Mesoamerica but acknowledged throughout the world. 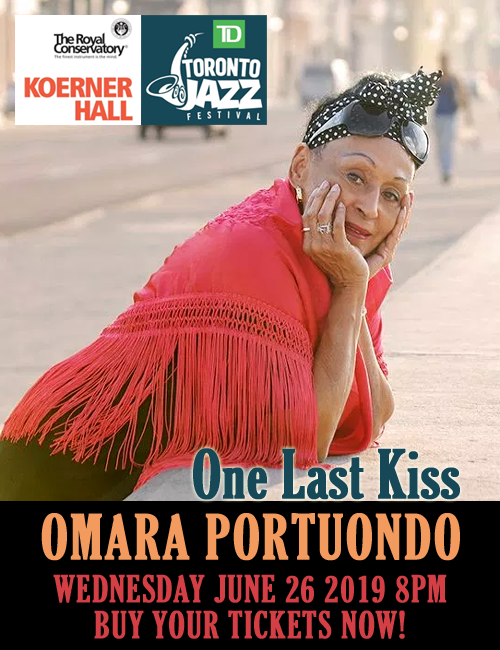 The festival provides people with the opportunity to rejoice in the living memories of their loved ones. Rather than being a festival filled with mourning and sorrow, Day of the Dead is a celebration of the life of people, their memories, their achievements, their impact on the coming generations; a celebration of the cultural alchemy of taking an elemental state, whether it be living or dead, and transforming it into another. The dead live through our remembrance and we live the lives of the dead through costume. 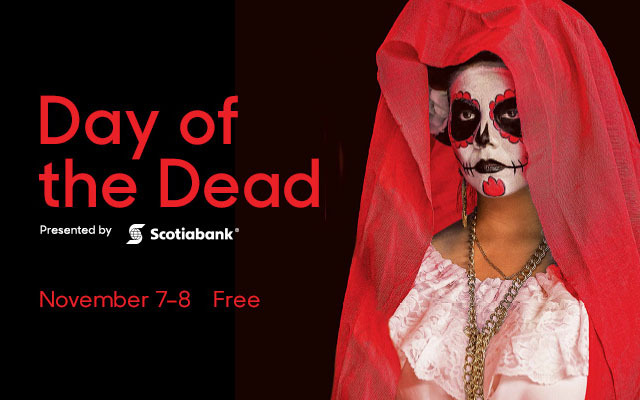 The Day of the Dead festival at Harbourfront Centre is the longest running in Toronto. In this year’s edition of the festival, we will explore the theme of alchemy as we merge old traditions with new narratives. The result is a liminal state between life and death, where the dead live and the living take the form of the dead.